Following is a technique used for standardizing copy for use in proposals, sales letters, marketing materials and other communications projects where appropriate. MindWorks, an SAP® Services Partner, provides SAP consulting, training, software and support. MindWorks, Inc., an SAP® Services Partner, provides SAP solutions to many of the world’s best-known companies, focusing exclusively on SAP consulting, training, software and support. MindWorks, Inc., an SAP® Services Partner, provides SAP solutions to the world’s best-known companies, focusing exclusively on SAP consulting, training, software and support. Due to MindWorks’ depth of SAP experience, clients look to us as a trusted advisor and partner that can maximize ROI and reduce TCO from their SAP systems. MindWorks is the only SAP consultancy twice named to the Inc. 500 list of fastest growing private companies. As the only SAP-focused midsize consulting firm in the U.S. that offers SAP project team training and remote SAP development support, MindWorks is the perfect partner for enterprise and midsize SAP-installed customers. M indWorks, Inc., an SAP® Services Partner, is a leader in providing SAP solutions to many of the world’s best-known companies, focusing exclusively on SAP consulting, training, software and support. Due to MindWorks’ depth of SAP experience, clients look to us as a trusted advisor and partner that can maximize ROI and reduce TCO from their SAP systems. MindWorks is the only SAP consultancy twice named to the Inc. 500 list of fastest growing private companies in America. High-profile clients such as Chevron, McKesson, Nike, Apple Computer, and the Department of Defense rely on MindWorks to lead critical SAP projects with a depth of knowledge and experience unparalleled in the industry. We maintain an exclusive focus on SAP applications and technology, while others try to cover many different development tools and ERP applications. We employ only the most experienced SAP consultants who deliver quality results. The typical MindWorks consultant has a minimum of seven years of SAP experience and 12+ years of IT knowledge. We strive to maintain a direct and lasting relationship with our clients and our consultants. We conduct business with honesty, integrity and professionalism. MindWorks, Inc. is an SAP® Services Partner, and works closely with SAP to deliver customized business solutions to diverse organizations, utilizing proven SAP technologies. SAP is highly selective about the companies with whom they choose to partner, and seeks only those which are leaders in their fields. SAP Services Partners are recognized worldwide as experts in implementing and supporting SAP technology. SAP’s services partners are consultants who help SAP customers implement and integrate SAP solutions, optimize business processes, and provide strategic business consulting. As a SAP Services Partner, MindWorks is part of a select group of SAP consultancies. The partnership is an affirmation of MindWorks’ high level of consultant expertise, client-focused processes, and exclusive focus on SAP services. Over the past 10 years, MindWorks has built an organization designed to help our clients achieve the greatest value from their SAP environment. As the only SAP-focused midsize consulting firm in the country that offers SAP project team training, remote SAP development support and SAP consulting services, MindWorks is the perfect partner for both enterprise and midsize SAP-installed customers. By managing three distinct service offerings we have the ability to introduce new features and capabilities within SAP; train the teams designated to build and deploy the system; consult on the project through Go-Live; then support the environment through an onshore support center staffed with some of the best developers in the country. Our ability to take this process from end to end gives us an advantage over most every other firm in the country—the ability to truly understand the customer’s business and help guide the improvement across the organization. 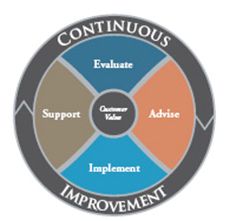 We call this the Continuous Improvement Lifecycle.